With a fully packed backpack and a torrid walking pace, I still managed to grab a few photos of the Loyalsock Trail while backpacking in North Central Pennsylvania. I wanted to travel extremely light, so I left my heavier Canon DSLR at home and grabbed my wife's Canon PowerShot 620 camera. This was my first mistake! The sensor is so small...and no way to shoot RAW. I really enjoy nature photography and would have liked to carry a tripod, two camera bodies and several lenses. This was more of a focus on a physical challenge and a mission to cover many miles in a short time. We had originally planned 3 nights and four days in the wilderness. Every single item's size and weight had to be considered carefully before stuffing it into our backpacks. Unfortunately, packing enough food, clothing and water were a higher priority than camera equipment. As you can tell from these photos of trail, I often looks for textures and patterns when I do nature photography. In the photo at the top, what caught my eye was the 3 waves of color: the green leaves at the top, the yellow leaves of the undergrowth and the reddish color of the ground and fallen leaves. 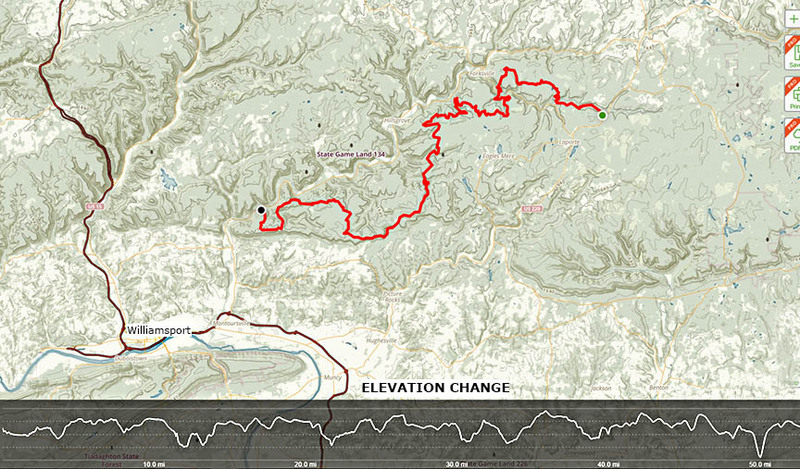 The loyalsock trail is just a smidgen under 60 miles long. I think one of the best features of the trail is its variety in terrain with waterfalls, ponds, streams, damp areas with lots of moss, and areas full of pine. It's perhaps one of the more challenging hiking options in the tri-state region. The elevation change has been reported at between 10,000 and 12,000 feet. There is also a loop option that is 22.9 miles. 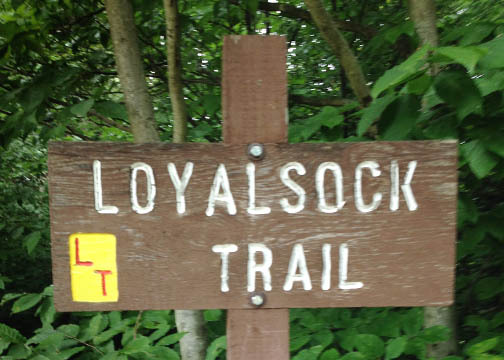 To access the Loyalsock trail on the western end of it, go 7 miles north of Montoursville on Rt. 87. 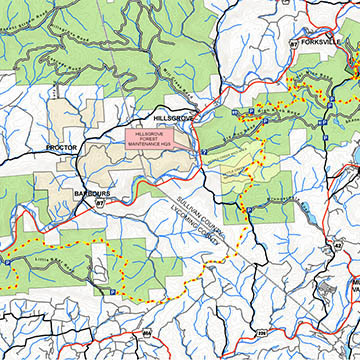 To access the trailhead on the east side, it's 8 miles northeast of Laporte, 25 miles west of US 220. Each season has its own unique photo opportunities, based on recent weather conditions. Generally, photographers like to take the photos of the Loyalsock trail when the fall colors peak in October. It's the most popular time. 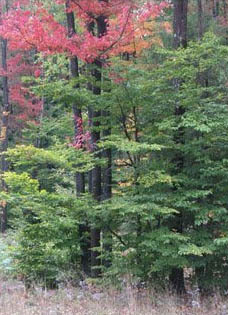 Visit http://www.leafpeepers.com/contents.htm (and other similar sites) to check the exact timing for peak colors. If you don't mind the cold and prepare yourself properly, winter offer some unique chances to capture snow and ice photos. You get enhanced views through the leafless trees in April, massive amounts of green everywhere in late May, and summers are hot and humid. 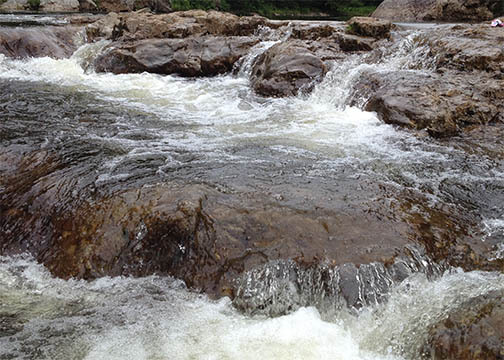 After snowmelt or big rain storms you have opportunities to capture overflowing creeks and small waterfalls. 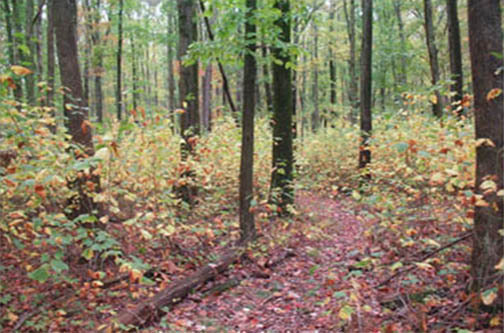 Warning: check hunting season dates with Loyalsock State Forest: 570-946-4049. One of the photo mistakes I made was not fulling checking the camera before my trip. I used the wrong camera setting on a photo of my friend on the loyalsock. One of the tips for taking digital photography that I listed on the Beginners Photography Tips is to know your camera before you go on your nature photography shoot. Many of the early photos were overexposed, because I did not fully understand the settings on this particular digital camera. 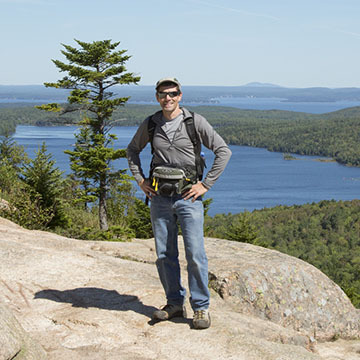 We had hiked up a steep slope to the breathtaking view provided by Smith's Knob. I had my subject stand in the sunlight, so that he and the distant valley behind him received equal light from the sun. My wife's Canon Powershot camera was set on shutter priority, but somehow had been set to add 2 stops of exposure. This resulted in blown away highlights and weird color shifts that I couldn't even improve in Adobe Lightroom. Fortunately, I often look at the camera's histogram to check for proper exposure. I was able to set the camera properly for the remainder of our Loyalsock hiking adventure. Whenever I use a camera that has the option to shoot "raw" unprocessed photos, I use that feature. This allows you to make all of those processing decisions afterward and can also help you compensate if you don't nail the exposure when the photo is taken. Our adventure was focused on backpacking and not on nature photography. We survived the slippery,steep inclines carrying our heavy loads, the cold nights and had no dangerous encounters with the bears. 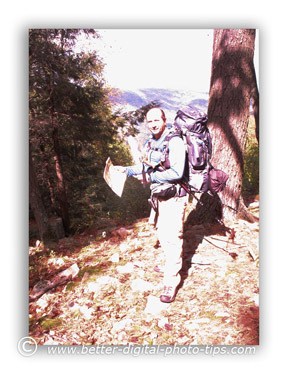 I look forward to returning to the Endless Mountains and planning a nature photography trip focused on getting great photos of the Loyalsock Trail. Have Fun!